The 100 minute film has two magnificent actors playing the leads and written by ‘star’ writers Vidhu Vinod Chopra and Abhijat Joshi. The duration, the starcast and the writers’ names are so tempting that you expect a crispy racy thriller. Despite all the factors, Wazir ends up as a partly predictable, hardly nail-biting with boring screenplay made further boring with pretentiously melody songs in between. Wazir starts off interestingly. The first 40 minutes quickly but exhaustively explores the emotions of the protagonists’ trauma. That is followed by the investigation drama which has a mundane tone without any highs. The characters played by Farhan and Mr. Bachhan seem like they haven’t been developed completely. And because of that the deserving emotion doesn’t get generated to the viewer when a certain mishap occurs in the movie. In the same way, when there is a twist, the expectation is to feel ‘OMG, I didn’t see this coming’ instead of ‘ohok..it’s just a twist’. Such bad writing and screenplay eventually makes Bachchan and Akthar’s sincere performances go in vain. The movie unfolds in Delhi where Danish (Farhan Akthar) is part of the Anti Terrorist Squad. He loses his daughter during a bullets exchange, while chasing a terrorist in his car. Shattered with the news, his wife (Aditi Rao Hydari) becomes estranged from him. Danish becomes friends with his daughter’s Chess Coach Omkar Nath (Amitabh Bachchan). Omkar Nath also has a sad story as his daughter was murdered a year before, but portrayed an accident by the police. Both the gentlemen bond over chess and vodka. Later Danish starts his investigation for the justice to his new friend. There are some scenes which are definitely very appealing and all of them are seen in the first hour. The scene when Danish comes to take the revenge of his daughter’s death gives an adrenaline rush. On one side, his eyes are shutting off and on the other side the angst in him is pumping up. Also the scenes which show the transition of Danish losing the chess games to winning them are so effective yet subtle. The dialogue writers have done a good job, especially the ones given to Big B. The parallels drawn to the chess game were interesting. 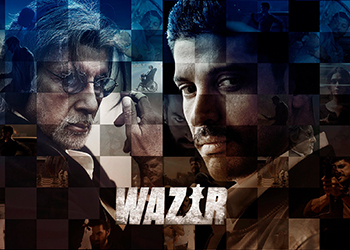 One can get reminded of Badlapur and Talaash at few moments in the film but Wazir is different in its own way. Making a comparison might not be a great idea. The main drawback of the film seems to be its predictability and the scarcity of the ‘thrills’. Also, the emotions don’t really connect. The songs could have played important role to emphasize the emotions, but none of the tracks from the music directors (6) for the film succeeded. Overall, the performances and the racy first 40 minutes make it a decent movie but not a decent thriller though. 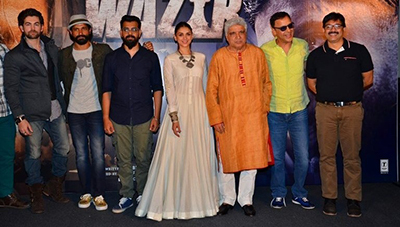 Wazir could have been made a lot better may be with such an interesting plot and talented cast. This was an opportunity wasted, perhaps.